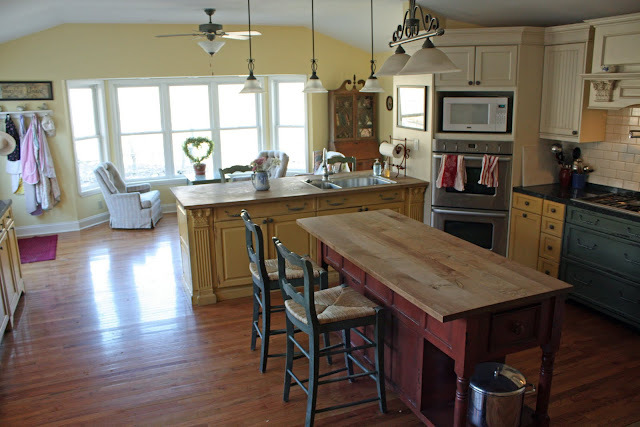 elcome to our farmhouse kitchen! I'm so glad you could stop by! If you'd like to see the before pictures you can go here. I've got some nice warm gluten-free brownies for you (best recipe ever to be posted on my blog soon! ), so come on in! 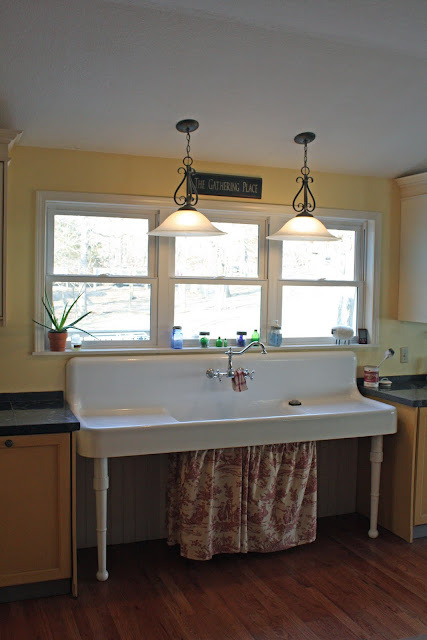 I think my beloved friend the antique farmhouse sink really steals the show... what do you think? 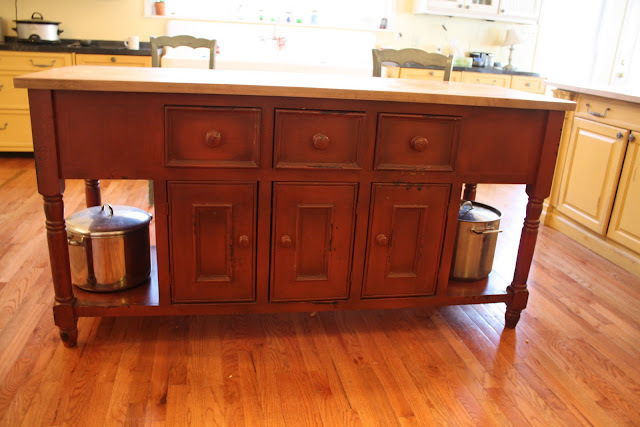 She is a 1920s sink that is 78" long, if you can believe that and those are her original legs too! You can read more about how I "met" her on my first kitchen blog post here. When we brought our sink home here and installed her I wondered if I would like washing dishes in such a shallow sink (6" deep!). It hasn't ended up being a problem at all. It is actually really handy for washing large pots. We do wash a lot of large pots here! 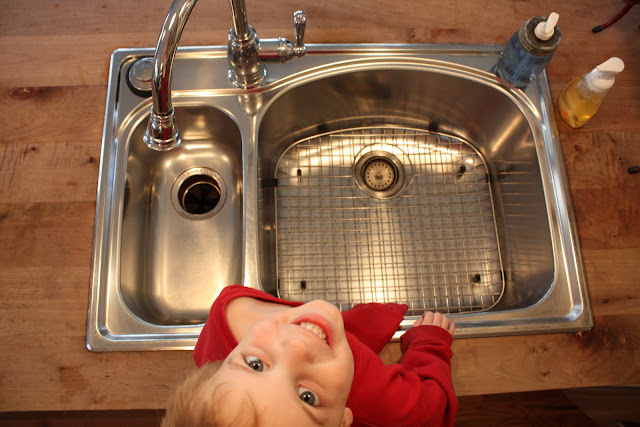 We do have two sinks in the kitchen which is really handy for a family our size (12 children). 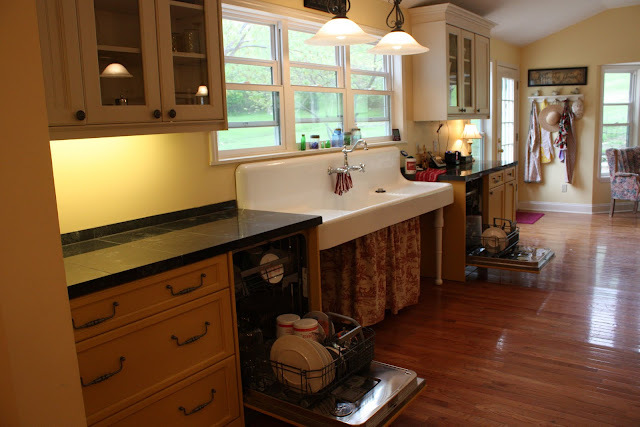 The farmhouse sink has ended up being the one where we wash the dishes. I think that is partially because the dishwashers (two!) are on either side of that sink. Can't see them? They're hidden! I am so happy with our cabinets! We found a local company (who sells nationwide) that sells at wholesale prices to local customers. British Traditions was fabulous to work with. I mean really fabulous! (Hi Kathy!) Kathy took the plans that we had drawn up and made them really sing. She translated them into a kitchen that has been and continues to be a total delight to work in. Not only that, but their prices totally beat anything else that I could find locally and I did considerable work getting competitive bids, etc. Kathy knew the budget that we were working with and came up with so many creative options to make it all work for us. 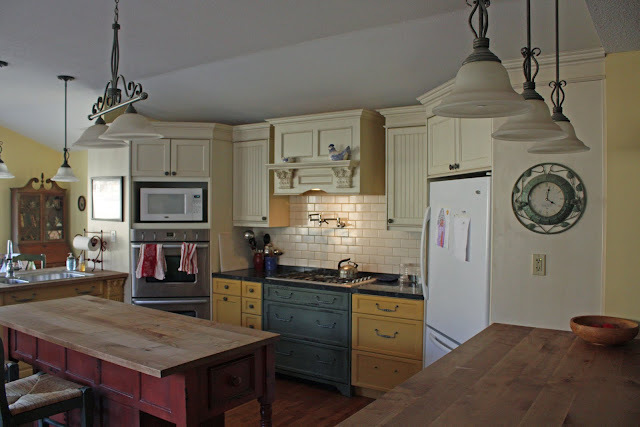 The only walls of cabinets that had to be custom made were the wall that the farmhouse sink is on and the wall that the cooktop is in. The center island and the peninsulas were actually all "islands" that British Traditions already makes, so they were much cheaper, comparatively, than custom. I was able to choose from lots of color choices and lots and lots of distressing options. Actually an overwhelming amount of options. At first I was sure that I wanted all white cabinets. I am so happy with the color that I chose though. Really happy. Here's a closeup of some of the distressing on one of the peninsulas. It's perfect for a large family like us... looks like we've already lived here for several years! We also have two pull-out trash cans that are "hidden" behind cabinet doors. I really like those. Having two is so helpful... one in the cooking area and one in the clean-up area. 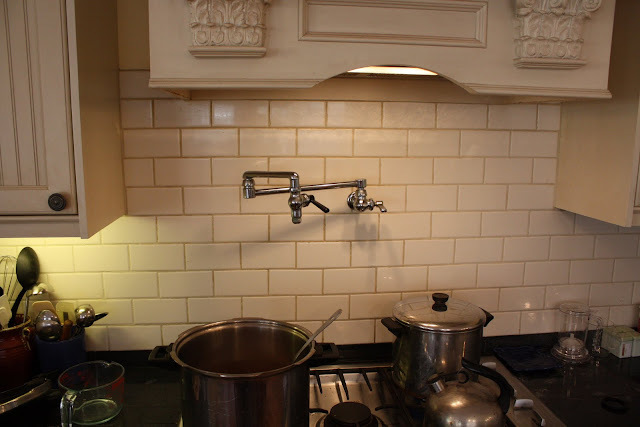 Did you notice my pot filler? This was an ebay purchase that I really, really like! 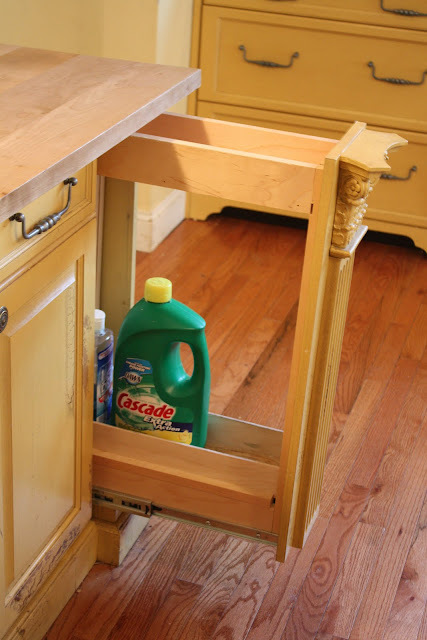 This is a super way to fill large pots without having to carry them from the sink to the stove. I think I use it almost every day. I actually found lots of things for our kitchen on ebay. The aforementioned pot filler, the double oven was a "scratch and dent" Fisher and Paykel oven that came with a manufacturers warranty. Even with shipping it was cheaper than anything I could find around here. I also purchased the dishwashers (Asko) and the Fisher and Paykel cooktop too from ebay... same deal~ much cheaper than even the Sears outlet or sale prices here and they've done really well for us. As I mentioned in my first post about our kitchen, we subcontracted some of the work out and we did some ourselves. collecting bids (this took a trememdous amount of time, but saved us so much money. I am extra proud of the tile on the countertops and the subway tile behind the cooktop. Why? Because I did those jobs all by my little self! I can't tell you how intimidated I was by the saw that was necessary to cut the granite tile. Scary, scary saw, with a capital S!! Tom had to work the day that we needed to install the tile, so he got me started and I did it! Aren't you proud of me? By the time we were ready to put countertops on, I was really needing to pinch pennies, so we opted for the granite tile. Do I like the granite tile? Ummmm, yes and no. For the cost ($1.37/sf) I really liked it. I like that we can set things hot from the oven directly on it. The only thing I don't like about it is that it isn't quite as easy to keep clean with the grout and all and it does tend to show smears, etc. pretty easily. 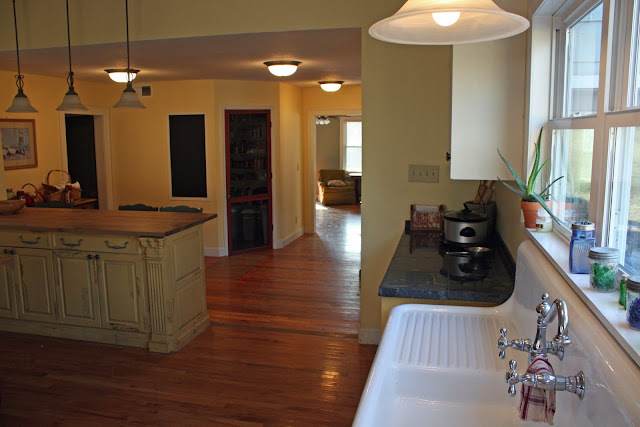 But, I don't really have that much countertop that is tile, most is butcherblock (which I really like! ), so all in all I'm happy with the countertops. The butcherblock countertops actually "came with" the center island and the "penninsulas," so I decided to use them, not knowing how I would like them. Butcherblock is really, really nice! I have been very happy with how they have worked for us. I was a little concerned about the stainless steel sink (also an ebay purchase!) that was set into the butcherblock countertop. I worried about the inevetible water that would sit on the countertop there. I do wipe up the water any time I see splashes or drips there, but the wood has held up great and has not discolored at all. 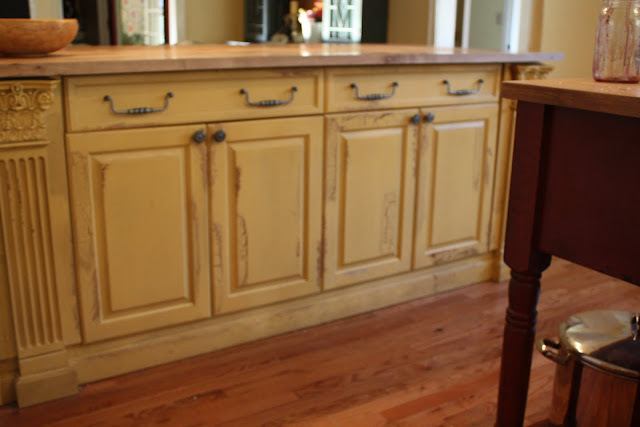 I did use mineral oil on the countertops initially, but they have not seemed to need any treatment at all since the time I did it initially. Here's our "other sink." (yet another ebay purchase!) It is super-deep and I really love the stainless steel insert that is in the deeper part of the sink. 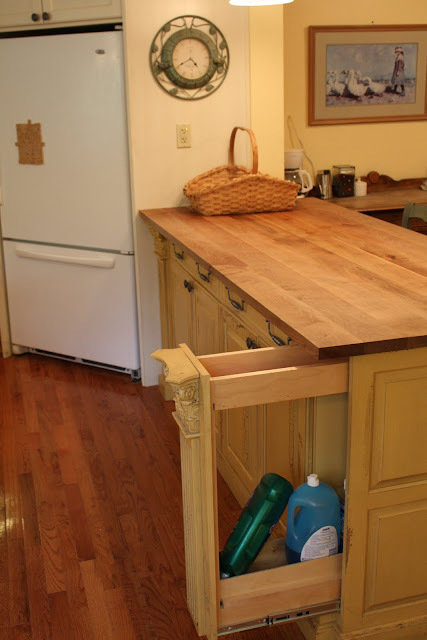 A few other things I really like about our kitchen; these cool pull-out cabinets at the ends of each peninsula. These are a nice use of otherwise unused space. 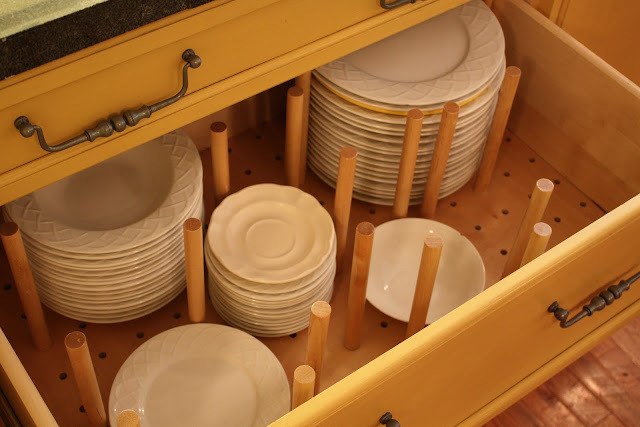 Also this plate drawer that is to the left of the left dishwasher. It enables little guys to get their own plates and bowls and to help unload the dishwashers as well. This has been really useful. 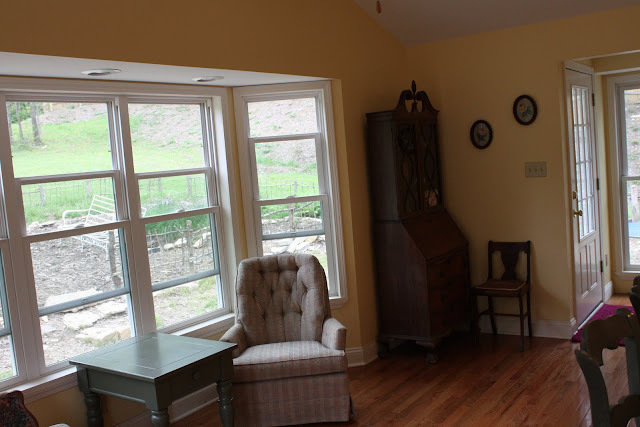 At the far end of our new kitchen is my favorite spot to sit and relax in our home. 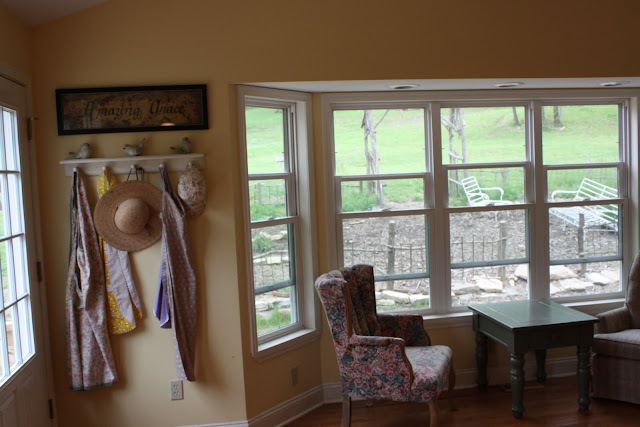 This bay window/sitting area is so peaceful. My gardens are out back and we feed the birds just outside the bay windows in the winter. I planned two doors exiting the kitchen~ one leads out onto our deck and back yard to the north and the other leads out toward my herb garden. 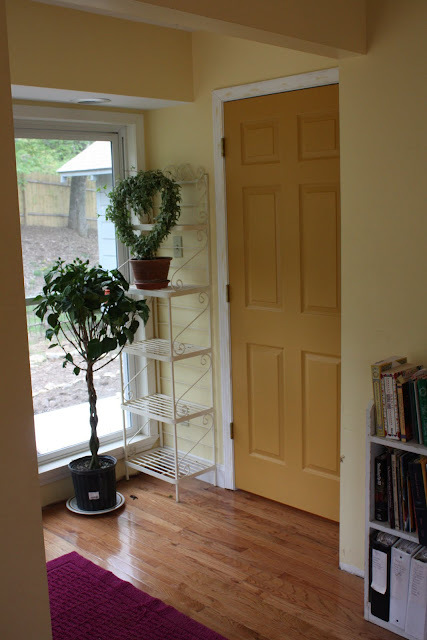 My plan was for that "herb garden door" to be the one that would be used when the children are muddy or dirty as it also leads down to my new laundry room. We decided to have a full basement under the kitchen so I could move my laundry area out there. Perhaps I can show that in another post. 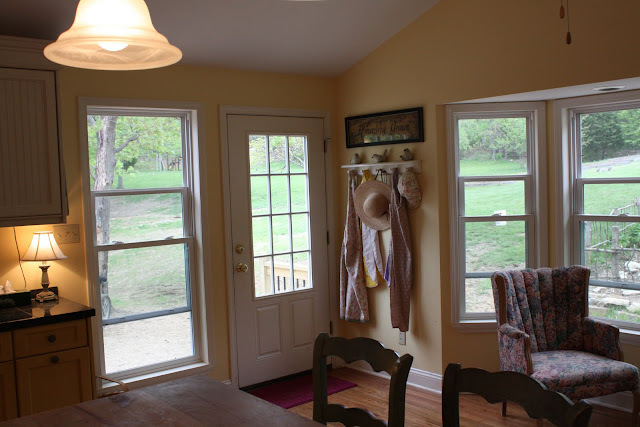 Here's the door leading down to the laundry room and our nice south-facing window. I plan to have many more plants there in the future. I'm thinking of overwintering lots of herbs next year there. Does my idea work, for containing the mud.... um, no. It usually ends up being the other door that is used. Oh well, it sounded like a good idea! But hardwood floors are easy to mop up, so it's ok! Now, you may wonder, what happened to the old, original kitchen? 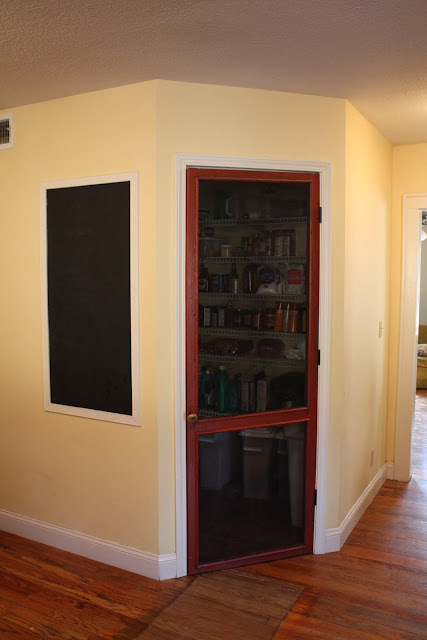 Well, we turned it into this really cool walk-in pantry! Do you like my screen door? I think it is so cute on the pantry! The chalkboard to the left of the pantry is my place to write weekly menus (when I'm good enough to plan them ahead, that is! LOL!) I think I need some sort of painted sign above the pantry... just haven't decided what to put there yet. I'm also planning to put some framed family pictures to the left of the chalkboard. It's always a work in progress. Here's the other wall of the old kitchen. So there you have it! Hope you enjoyed your tour as much as I enjoyed having you over! There are plenty of brownies, so help yourself to another one before you leave, ok? If you have any questions, feel free to post them in the comments section of my blog (if you are reading this in a reader or on Facebook, you'll have to come to my blog) and I'll try to answer them in another post, ok? ** I am linking up with Metamorphosis Monday here! Wow! Your remodel is beautiful. Y'all did such a wonderful job. Again, beautiful. Thank you for taking th time to show us. 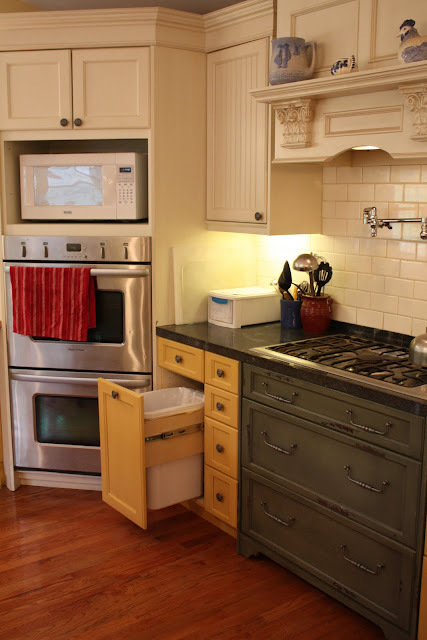 We too did granite tile and it is the thing I am most proud of! Please do show the laundry area. It is a treat to see how other large families do things! Thanks again, everybody! Ya'll make posting here a total joy! jacquisj, thanks for the tip on polishing the granite. Now I'm wondering when I get to see all of *your* kitchens! Susan, I commented to you on my post, but want to make sure you our home and kitchen are beautiful, and I'm so glad you get to enjoy it NOW, with so many of the children still at home! These opportunities are so good for me to examine my own heart, which, often isn't behaving as it ought! Blessings to you, and continue the beautiful blogging! 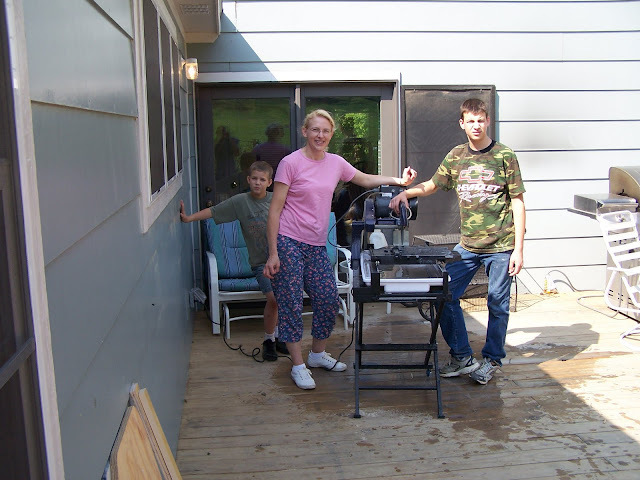 Large family stories inspire me, and what you accomplish encourages me. Did I miss where you guys eat? Thanks Kathy, I did see your reply on your blog. I appreciate you and your honesty, friend! Actually we don't eat! LOL! Eat? What's that? I'll just take another brownie, thank you! Actually our super-long dining room table is in our living room/dining room. It's one long rectangular room. I'll try to show a pic soon. Appreciate your kind comments. Want another brownie? Or some fresh goat's milk to go with it? 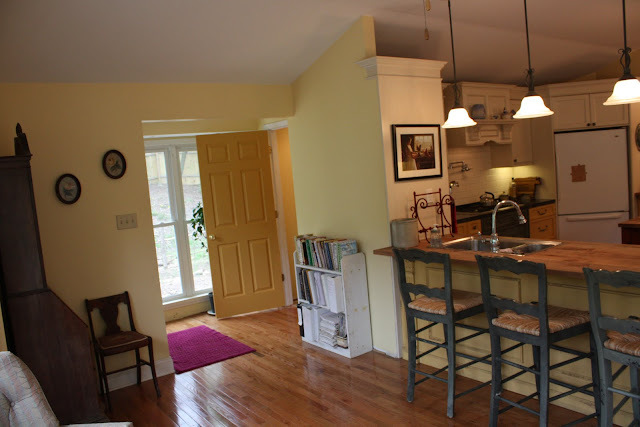 Great kitchen and i love the different color cupboards or islands. I think u should take that toile skirt under the sink and extend it to each leg. Super awesome kitchen! Beautiful kitchen for a beautiful family. I know you all will enjoy it for years to come. Again, great job. Enjoy your kitchen. That sink is great! That is a beautiful...and most importantly....very functional kitchen. I LOVE the vintage sink. I love it all. 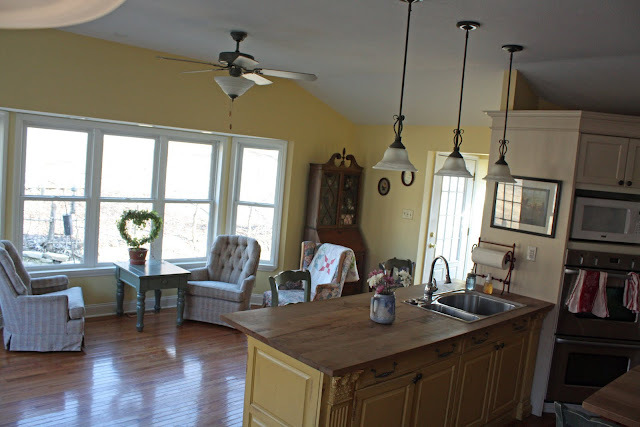 We also cook for mass quantities, so I know how important a great kitchen/gathering spot can be. Kitchens truly are the heart of the home. 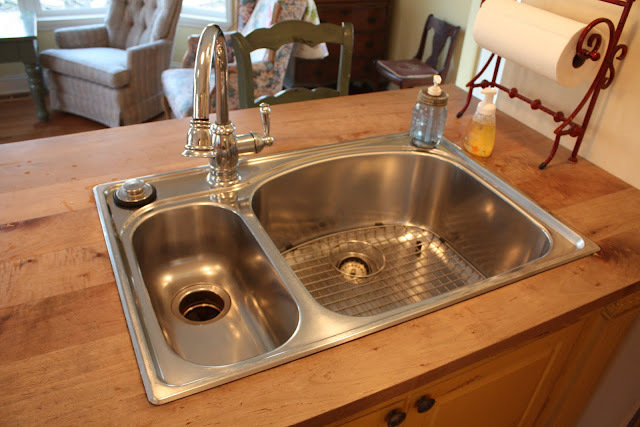 What a fabulous old farmhouse sink!! Such a gorgeous addition to the whole look. I absolutely love your kitchen. We have 2 of many things as well. 2 washers, 2 fridges, 2 freezers, waffle irons, bread machines, etc., but no 2 dishwashers though. My hubby tells me I have 12 of them! You enjoy your blessing form God and never feel bad for what God has blessed you with. We all have times when it is our turn for God's blessing~ I am rejoicing in your blessing! You have a lovely blog and a beautiful family. I enjoyed my visit! I got here through Cinnamon's site and I just had to tell you that I love your kitchen! That sink! I plan on getting a sink like that someday! It's GORGEOUS!!! 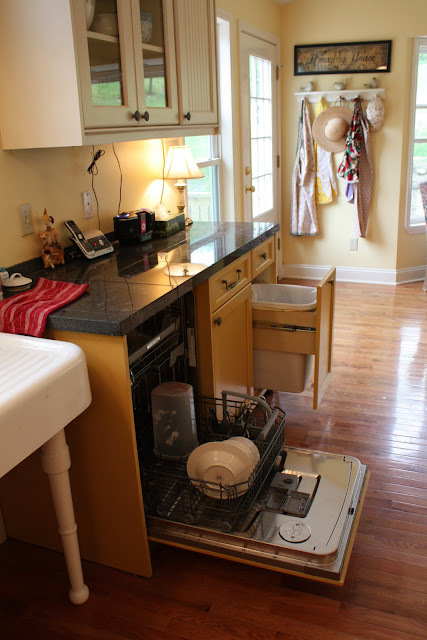 And how nice that you have 2 dishwashers, too. We have a household of 8 (almost9) and I'm running the dishwasher frequently! I have never seen another kitchen like this but now I'm in love. 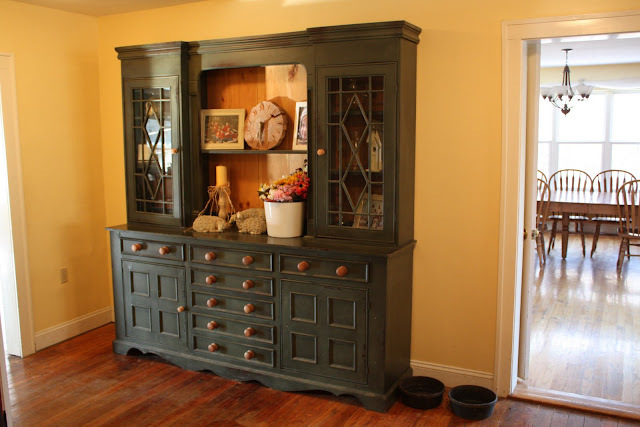 I adore the mix of cabinet colors and the paint jobs on them. That farm house sink is to die for I tell you! Sheila, Mishebe, Lori, Susan and Joan, so nice to see you here! Thanks for all the kind comments. I really appreciate you taking the time to comment on my blog! Thanks! Allison, your kitchen sounds beautiful, for sure. Ginger, I *miss* you, friend! Will you stop by sometime soon? I'll call you or you call me soon, k? Welcome, Mommyx12! 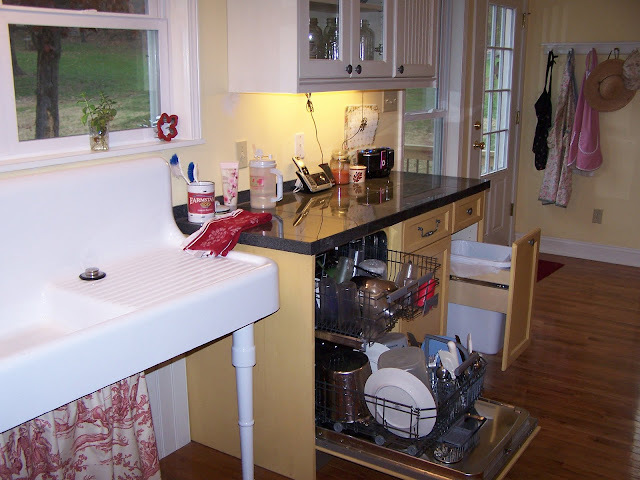 Totally know what you mean about having 12 dishwashers~ LOL~ what a blessing *that* is! Yes? Nice to meet you here... hope you got a brownie! Treasia and Shanda, thanks for your encouraging comments~ glad you enjoyed my kitchen. I'm glad you stopped by! Hope you got a brownie as well! I am drooling over that sink. I think I just may move in. Hey there, West Coast Nester, we've got lots of room, come on over! Love EVERYTHING....so glad you shared it with us....especially loved the cabinets.. Having trouble sleeping tonight so decided to blog hop. Love your blog.. Hope you will stop by mine...I just added some extra giveaways that I am drawing for on Sat night. Your kitchen is beautiful!!! I love how open and bright it is. You did a fabulous job picking out everything. The big sink is cool the cupboards are gorgous, love the floor, would love to have two of things,love the pantry door ( that's something I would do) the light fixtures are beautiful and perfect, love all the different colors, well I guess I just love all of it. I'm sure you are very happy with it after all that hard work. Thanks so much for taking the time to show all these pictures and the stories behind each one. Brownies are my favorite sweet, how did you know!! I ate two now and taking two more home with me, thanks so much for sharing. ~Teresa, so nice to "meet" you here! I'm glad you could stop by! ~Dawn~ Thanks! I'm really glad that you like the brownies~ we enjoyed having you visit! Hope you have a great week! 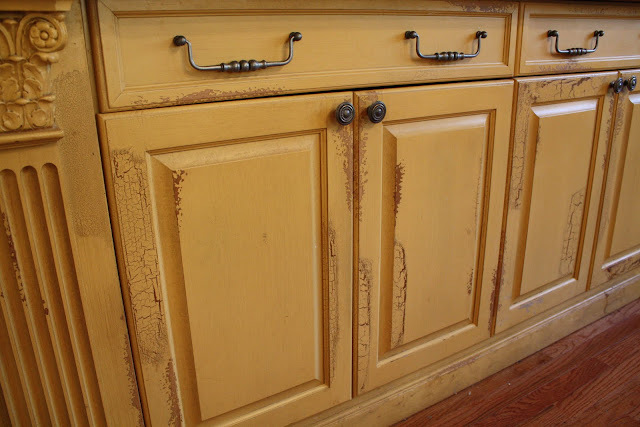 Oh my word...I just found your blog and your kitchen make over. GORGEOUS!!!!! I love it! This in honestly my dream kitchen! You did an amazing job and every detail is just perfect. I'm officially jealous!! 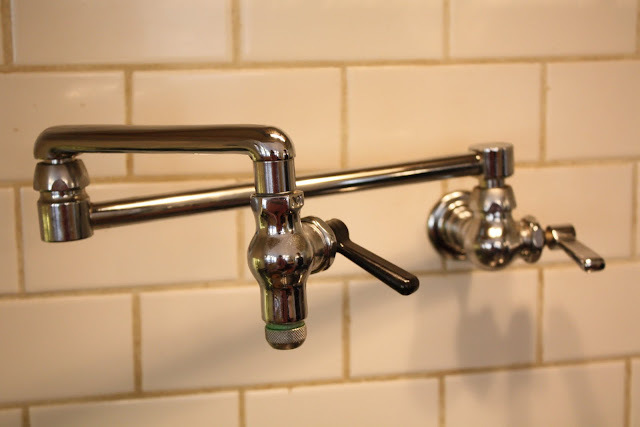 Some day, when we build a house to look like a old farm house, I will look for a similar sink. 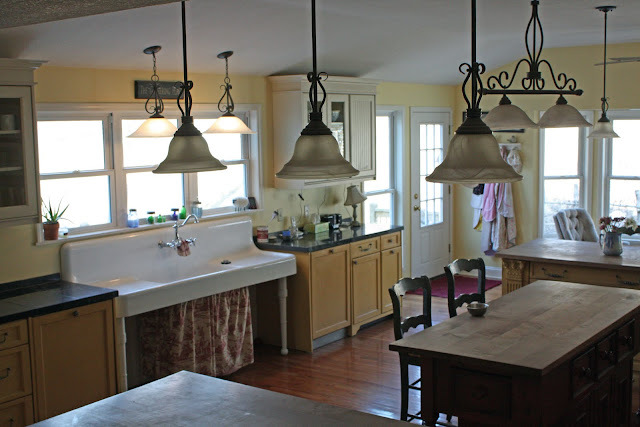 you should put up a sign above the pantry "country store"
Wow, I so love your kitchen - the whole addition to the house. Just beautiful.